An essay written by Fr. Joseph F. Wilson in 2001. Every once in a while, my friend Father Bradford will take the opportunity to get away for a brief break. I am always glad to encourage him to do so. I am sure that I always encourage friends to take their breaks and refresh the spirit, with the zeal of one who is thoroughly bored by vacations and thus avoids them while living them vicariously through others; but my reasons are more than a bit selfish for urging Father Bradford to get away and take his time, with Mrs. Bradford. You see, Father Bradford is an Anglican Use Priest of the Roman Rite (which is why there is a Mrs. Bradford), chaplain to the Anglican Use congregation in Boston. And when he folds his tent and steals away, I get to fill in for him. And I have a few thoughts to offer on that experience. The Anglican Use is a fruit of the Second Vatican Council. The Council Fathers, expressing their hopes for Christian unity, said that in the future it should be possible that worthy elements of the patrimony of piety of other Christian bodies might find a home in the Catholic Church (as radical as this might have sounded to Catholics before the Council, it was seriously discussed at the time of the Council of Trent, four hundred years earlier). In the early 1980s, responding to the overtures of groups of Anglicans who were seeking to come into the full communion of the Catholic Church, the Holy Father established the Pastoral Provision. 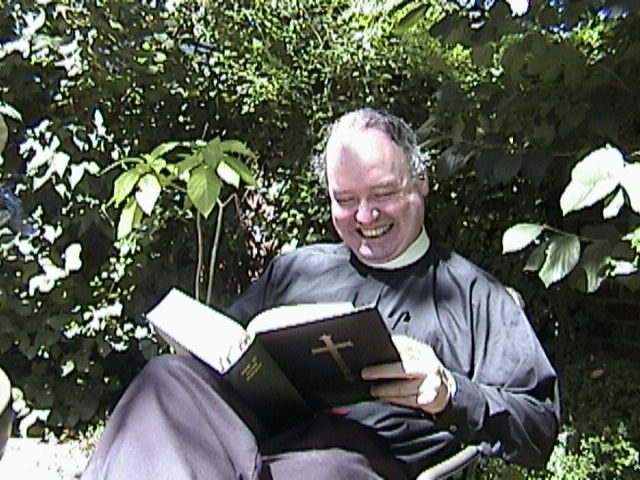 By it, Anglican clergymen received into the Church had the opportunity to present themselves for the possibility of ordination as Priests even if they were married, and groups of former Anglicans could, with the permission of the Bishop, continue to worship together using rites based on the Anglican liturgy, carefully adapted to conform in essentials to the Roman Rite. A group of parishioners of All Saints Episcopal Church in Ashmont, Massachusetts, parted company from their Episcopal brethren several years ago, and, under the leadership of Father Bradford, were received graciously by Bernard Cardinal Law into full Communion, and Father Bradford was ordained. They are the staunchest group of Catholics you could ever want to meet, having studied the Catechism and embraced the Faith whole and entire. They form the Congregation of St Athanasius, worship at present in the convent chapel of St Theresa’s, West Roxbury, and I count it a great privilege when I can tbe of service to them as a Priest. And the experience of celebrating Mass in a different ritual has led me to reflect on my experience of fifteen years as a Priest celebrating the Novus Ordo. Celebrating according to the Anglican Use is a very different thing, you see; and one realizes that from the start of the rite. Having vested, and joined in the sacristy with the servers and the gentlemen of the schola in the preparatory prayers — the old prayers at the foot of the altar — the procession begins, and makes its way to the Altar as the opening Hymn is sung. From the very beginning, I experience the Anglican Use liturgy in a very different way from the Novus Ordo. Daily and Sunday in my own parish, I reverence the Altar, go to the chair and, facing the people, initiate a dialogue with them, and I am even encouraged by the Liturgy to offer introductory comments. Ascending the Altar in the Anglican Use Liturgy, I first reverence it with a kiss, then proceed to the epistle side to charge the thurible, and incense the Altar. The text of the Mass is based upon the Book of Common Prayer; the ceremonies are the traditional ceremonies of the Roman Rite. When I am standing at the Altar, I am facing eastward, in the same direction as the People, the direction of the rising sun, in the ancient symbol of the whole Church gathered in prayer awaiting the Second Coming of the Lord. Therefore, upon finishing the incensation of the altar, I move to the epistle end to begin, Blessed be God: Father, Son and Holy Spirit, to which the people respond, and I then pray the ancient Collect for Purity, …cleanse the thoughts of our hearts… that we may perfectly love Thee, and worthily magnify Thy holy Name… Then, to the center of the altar as the Kyrie is sung, and the Gloria. I kiss the altar and turn to the People to sing, the Lord be with you;with their response, And with thy spirit, I move to the epistle end of the Altar and sing the collect, and we sit for the readings. I set out the beginning of the rite in some detail for a reason; the ceremonies described will be familiar to anyone who is acquainted with the traditional ceremonies of the Roman Rite. The reason I offer the detail is to set the context for my reflection on how different my experience of this ritual is from the Novus Ordo, for I find the Anglican Use rite with the traditional ceremonies extraordinarily liberating. In a sense, it is paradoxical that I should find it so liberating — from the modern perspective, it offers very little freedom. From the very beginning of the Liturgy to the end (except for my sermon) my words, and actions, and posture are carefully ritualized. Instead of mounting my president’s chair (I generally refer to it as the Captain Kirk Chair) and initiating a dialogue with the people, offering ad-libs on the feast or whatever, I deliberately, consciously have to enter into this liturgy with the assembled Faithful. I have my part to fulfill in this rite; they have theirs, and together we enter into the worship. This is not something I am directing, or coordinating. My gestures are carefully prescribed, and once I am done with the incensation of the Altar I stand before it, facing God as it were, in the same direction as the People, and we begin to address Him, we begin our worship. I am not putting it too strongly at all when I characterize my reaction as feeling liberated by the form the ritual takes. I’m not carrying this rite forward by the force of my wonderfully magnetic personality. I’m entering into it, submitting to the Liturgy’s rhythms, with the People, and the effect of this on me is a much deeper sense of common worship. There is nothing more frustrating than attempting to discuss music in Catholic worship. It is maddening. Many Catholics are fierce partisans of the contemporary renewal music of the Eagles Wings variety. They are insensible to how transitory this music actually proves to be, how quickly the new hits become tired (and how most of the congregation doesn’t even attempt to sing them! ), how much of the music in Glory and Praise, the folk hymnal, has dated terribly after just a few years and is never sung at all. Traditional Catholics, on the other hand, often long for the glory days of “Mother Dear, O Pray for Me,” the St Gregory hymnal and the old devotional hymns. It was my experience as a choir boy in my parish church which first sparked my interest in Anglican liturgy — our choirmaster was a convert, which was a blessing, and one soon figured out where all of these wonderful motets and hymns were coming from. In the Anglican Use liturgy, one draws upon a hymnal of six to eight hundred hymns, solidly Scriptural and Liturgical (you come for Mass on the Feast of St Michael and All Angels, you get hymns honoring the Angels; you come on the Annunciation, you get Annunciation hymns!!). The hymns are PART OF THE WORSHIP — the whole congregation joins prayerfully in the whole hymn, from beginning to end, instead of using it as filler and doing a verse and a half until Father gets to the chair. And the parts of the Mass — Kyrie, Gloria, Credo, Sursum Corda, Agnus Dei – are all set to beautiful, singable music. For me, the whole experience of worship is transformed when I have the chance to celebrate in the Anglican Use. I’m a cradle Catholic; I made my First Holy Communion in 1967. I grew up in the age of post-conciliar liturgical renewal. I vividly remember making my way to the altar rail in 1968 as the folk group bawled out, “Blowing in the Wind.” I am used to polyester vestments, incredibly banal liturgical texts, poorly chosen hymns rushed through and cut off as soon as possible, the forty-five minute Sunday Mass (the Catholic Church’s answer to fast food restaurants). What a joy it is, then, when Father Bradford goes away. What a pleasure, to join with a congregation in a rite which seems utterly timeless, which is theirs as much as mine, in which we are never looking to entertain each other, but rather join together to approach God. The words of the rite are traditional, rich, profound and lovely, and a deep part of each of us gathered there. How heartening it is to be saying things like,”And grant that we may ever hereafter serve and please Thee in newness of life, to the honor and glory of Thy Name, or those lovely words we say as I kneel at the altar before Communion, … grant us therefore gracious Lord, so to eat the flesh of Thy dear Son Jesus Christ, and to drink His Blood, that we may evermore dwell in Him, and He in us… I once, in an acerbic moment, explained to someone who had asked about the difference between the Anglican Use Rite and our Novus Ordo, The difference is that at Vespers, when the Anglican Use folks sing in the Magnificat, For, behold, from henceforth all generations shall call me blessed, we are reciting, I betcha everybody calls me Happy. Slightly exaggerated, I suppose, but there is a point to it. And, may I add, I’m NOT saying that Elizabethan English would work for regular Catholic parish liturgy, at all, at all. But cafeteria English hasn’t worked, either! So, what’s the point to this article? Well, it is written, as I have noted, by one who grew up in the postconciliar mess, who made his First Communion in 1967 at the age of seven, and watched the Church collapse around him as he grew older. And who cannot help but wonder — was all of this really necessary? If the goal was liturgical renewal, was it really necessary to so violently overhaul the form of the Mass that people had to lose the sense of continuity with the Tradition? If you’re tempted to protest that observation, please stop and recall the folk group bawling “Blowin’ in the Wind” as a communion hymn in 1968. People in my generation grew up with no sense of continuity at all — the only things valuable and valued were innovations and novelty. And look at the devastation that resulted. I readily concede the usefulness of the vernacular, and that there were aspects of the Liturgy which needed revision, but the rite we used for Mass before the Council was truly ancient, well-established by the time of Gregory the Great, and gave full expression to the vertical dimension of worship. The richness of that rite, very conservatively revised where needed, traditional ceremonies intact and made more accessible to the people through use of the vernacular as appropriate, and with texts carefully married to plainchant and with good hymns, could have resulted in every parish having the kind of experience I have with the good folk of St Athanasius — the profound sense of joining together in a communal stepping into the worship and submitting ourselves to the rhythms of the Liturgy and Tradition of the Church. And had that been done, Catholics might not have gotten the impression that, the Mass having been turned upside-down, everything else in the Church’s teaching was up for grabs, too… Presently, the music, manner of celebrating, and entire atmosphere of the Novus Ordo all too often leaves one feeling that this is a prayer service cobbled together by the relative genius of the participants; there’s no sense of anything having been handed on at all. And this is especially true at major ceremonies. It seems that, every time I am present for a liturgy celebrated by a Bishop, he experiences the driving need to assert that he is the host of the occasion — lengthy commentaries from him open and close the rite (after he has marched down the aisle as though he were running for re-election, kissing babies and glad-handing congregants). But it is Jesus Who is the Host of the occasion; and I know that I have experienced this most notably at the Anglican Use Mass. That there is something lacking in the Novus Ordo is beyond question, as far as I can see — it was to have been the occasion of a great renewal, and after thirty years we can look back and see how many people simply stopped coming to Mass! Being able, as a Priest, to celebrate with a different rite has perhaps given me a new perspective on something I find lacking in the revised Liturgy. It has certainly convinced me that there is something wrong with the president’s role as currently understood, enthroned as I am in my Captain Kirk chair, facing the people and dialoguing with them. I’d dearly love to be free of the tyranny of that Chair. I really long to be able to skip the dialogue, abandon the liturgical talking points and the jabbering and the chatter, and to be able to –have you guessed?? — just go with my People to the Altar of God, to God who giveth joy to my youth. Fr Wilson has been a priest of the Roman Catholic Diocese of Brooklyn since 1986, engaged in parish ministry.